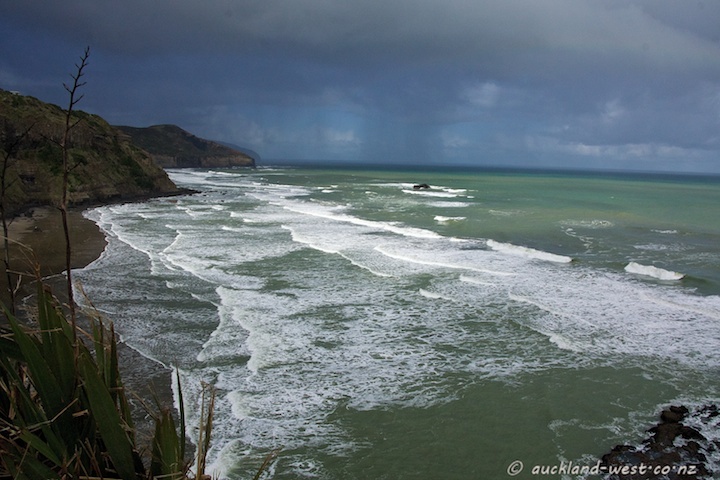 Yesterday morning we left home in bright sunshine, but by the time we had reached Muriwai, threatening clouds had come up. A last few hopeful rays of the sun, and then the showers came down. We are looking south from the observation platform of the gannet colony, Maori Bay in the foreground. There were about a dozen gannets at the colony, a long way off the 1200 breeding pairs we will see here in 1-2 months time. What a fantastic dramatic sky! That combination of sea and sky is what my dreams are made up of. Oh but this is so very beautiful, even with the rain. Incredible view! I like being able to see the rain on the horizon.